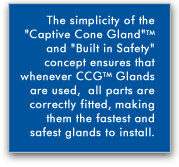 CCG commenced production of the unique patented Captive Cone Gland in 1972 employing just 10 people. Today CCG is recognised as one of the major specialised manufacturers of cable glands and junction boxes in the world employing over 140 dedicated people. From the beginning CCG has placed emphasis on the user's input to enhance design innovation. CCG's policy of "building in safety" and "designing out complexity" has meant that discerning engineers world-wide have recognised CCG's products for their time and wastage saving features. The simplicity of the "Captive Cone" and the "Built in Seals" concept means that no matter where in the world CCG products are being installed, the simplest of instructions will ensure that all the parts have been correctly fitted. This concept is very important for installations and projects in developing countries where unskilled labour is very often used. CCG Products are produced under the quality management system ISO9001-2000 standard underwritten by UL USA. Where applicable, CCG Products are internationally certified to British, CENELEC/ATEX, Chinese, South African, IEC and Australian standards. With a fail safe design, a quality approach to manufacturing and a dedicated international distribution and service network, the following companies, amongst others, have specified, used and put faith in the CCG Products. ALCOA, Anglo American, Ashanti, BHP-Billiton, CSBP Wesfarmers, De Beers, Korean Zinc, Minara Resources, Newmount, Mt Isa Mines, Pasminco, Rio Tinto, UK Coal, Western Mining. ARAMCO, Apache Energy, BP, Blue Water Marine, BASF, Caltex, ESSO, Kvaerner, Nippon Oil, Petronas, Petro SA, Philips, QPC, SASOL, SHELL, Woodside Petroleum. Alstom, China Light and Power, ESKOM, Hong Kong Electric, Siemens, Tarong Energy, Tenaga National, Western Power. Bangkok MRT, Bombardier, Chep Lap Kok Airport, Channel Tunnel, Fincantieri, Hong Kong MTRC, Kuala Lumpur International Airport, Oceanfast, Singapore MTR, Telcom. CCG Products are produced under the quality management system ISO9001-2000 standard underwritten by UL USA. CCG Products are internationally certified to British, CENELEC/ATEX, Chinese, South African IEC and Australian standards where applicable.